Say, “How many of you were afraid that you wouldn’t find a friend here? Even adults get that feeling sometimes when they go to a new place. Today we are going to talk about good ways to make friends and even learn some things not to do! Then we will practice what we have learned." Begin reading You Will Be My Friend. With each attempt, Lucy Bear has some problems. Discuss what happens each time. Eventually Lucy was getting angry as she approached a potential friend. Did that work? Always be yourself. You won’t have things in common with everyone. Do not force friendship on someone. Go out to the playground and talk about the things you could do outside. Maybe playing tag, or climbing on the equipment or playing with a ball. 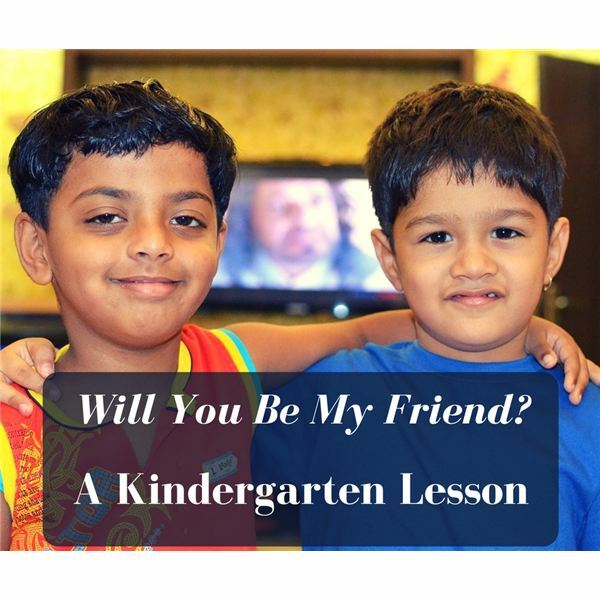 Ask students what would be a good way to form a friendship. Then act it out. For example, the children are playing tag and a new student could ask, “Can I play, too?" Encourage the others to include the new person. Conversely, if they see someone watching but being shy about asking to join in, someone could say, “Do you want to play with us?" When playing a game in the classroom a new person might ask, “Can I play, too?" Try to include the new person if you can. However, if you are in the middle of a game the answer might be, “You can play when we finish this game but you can watch us now." If you have to sit with someone or are teamed up with someone you don’t know, you might say, “Hi!" You might even tell him your name and ask what his name is. In the lunchroom you might ask, “Can I sit here next to you?" Then there are always things to talk about even if it’s just about the food! Examples of friendly behavior should be acknowledged. Call it to everyone’s attention! You might say, “I like the way that Jason was welcomed into the game you are playing." Encourage the children to “tattle" on a good act of friendship. For example one could report, “I fell down and Lisa helped me up and asked if I was hurt." Friendship is contagious! It will spread and promote a safe, respectful and happy classroom or group. Brown, Peter. You Will Be My Friend! Little, Brown and Company, 2011.